Effective – Provides social and economic benefits. Efficient – Provides benefits by using materials, energy and water as efficiently as possible. Cyclic – It will be recoverable through industrial or natural systems. Safe – It is non-polluting and non-toxic. Biodegradable – completely disintegrates, contrasting with EPS and other foams that remain for hundreds of years. 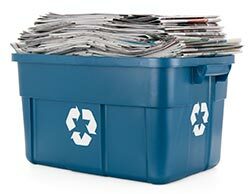 100% Recycled – made from recycled newsprint, saving both energy and resources. Fully Recyclable – in either curbside collection or back to source for re-use. European Green Dot Compliant – broadens your market to European customers. Conforms To ISO 14000 Standards – appealing to strict requirements of ISO-compliant purchasers. 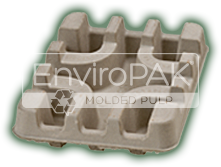 Uses Renewable Resources – newsprint is a renewable raw material unlike EPS and plastic resins, which are petroleum based. Compostable – appeals to the broadest spectrum of consumers.